When was the last time you saw a thousand years in a single glance? Have you ever seen how a dying relic can bring new life? Today, you will. The Magic of Travel stayed with me well after the weekend as I was practically swept up into visiting the Muir Woods national park which contains one of the planet’s last remaining primeval forests, complete with one of the tallest species of trees on the planet: the Coast Redwoods. I’m super excited to share this article with you all because it was a life-changing experience for me. And in this article I’m going to give you a brief tour of what I saw at the Muir Woods Monument by consolidating the story into five main things I learned during my time there (including the answers to the questions above). 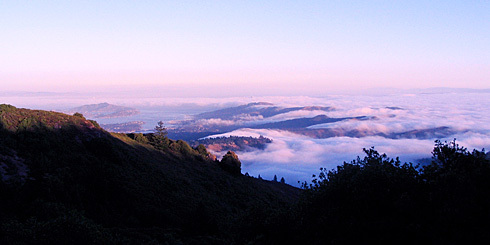 And as an added bonus, at the end I’ve added the breathtaking view from Mount Tamalpais that we saw at the end of that same day. 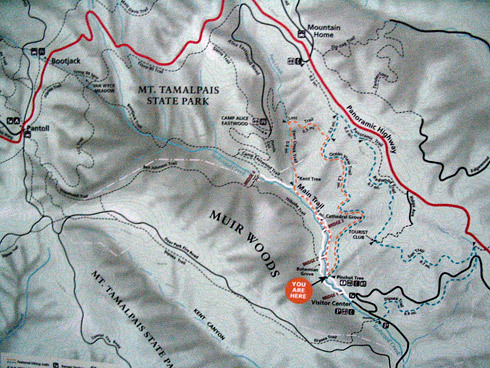 So what are the Muir Woods, anyway? And what makes these redwoods so special? Behold! The Vast Muir Woods. If the map above reminds you of something out of Tolkien’s Middle Earth, I can’t say I blame you. The topography feels old, and the park itself is enormous. 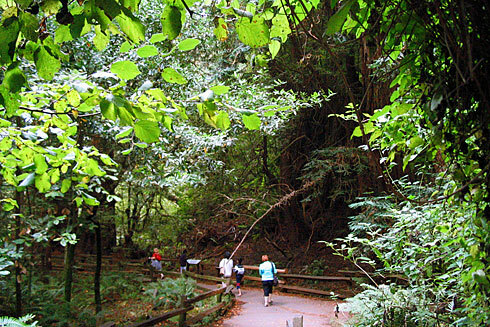 Named after naturalist John Muir, the Muir Woods National Monument covers an area of over 220 hectares (that’s over 550 acres!). It’s most easily accessed by car, and it costs around $5 per person (which, as you’ll see, is totally worth it). The coyote warning on the billboard near the parking lot came as a surprise. Apparently, bringing pets down the trails was an unequivocally bad idea because it attracted predators. It made sense, but I couldn’t help but find the advice “If attacked, fight back aggressively” slightly amusing. Only when we walked under the Muir Woods sign arching over the path did it completely sink in for me that I was about to meet redwoods—the tallest of all living things—for the first time. When I came to a closely-knit group of Coast Redwoods towering high above me, I stopped for some time, admiring their immense size. And nearby I noticed a plaque explaining how they’d grown so close together. 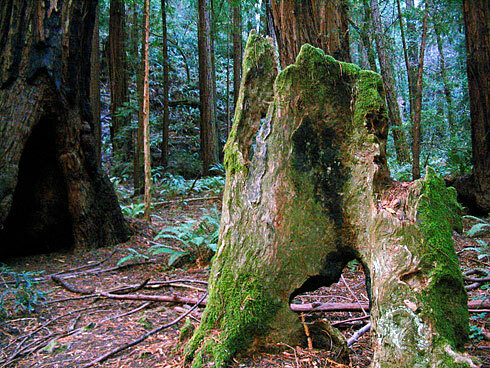 Apparently, a single redwood had grown there hundreds of years ago but was severely damaged so that its trunk had died. The exact cause of this was unknown, but not all was lost. Despite the terrible damage, the tree’s root system had lived. In time, hundreds of young, bright-green burl sprouts began to spring up out of the ground, forming a circle around the root crown of the original tree. The ring of trees I was now looking at was a direct result of that ring of sprouts that had emerged from the original redwood. Nearby was this incredible display of a cross-section of a Coast Redwood tree. And since the scale of this doesn’t come across that well in the photo, I want to make it completely clear to you: this cross-section was ginormous. 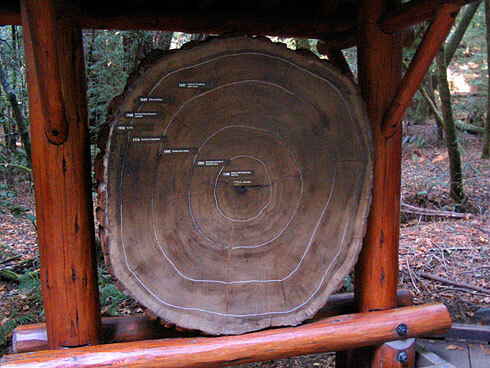 According to a plaque nearby, a careful study of this tree’s rings revealed that it had lived for 1,021 years! The painted white lines on the cross-section highlighted some of the historical events that occurred in other parts of North America while the tree was alive. Do you realize what this means? It means I was literally seeing the effects of over 1,000 years of history in a single glance. And you certainly can’t say that every day. 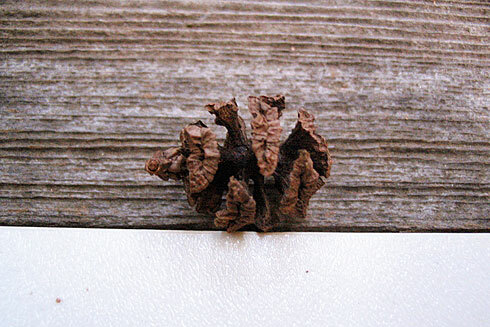 As I kept walking through the forest which towered high above me, I came across a single, tiny pine cone set atop a white plaque which happened to be all about redwood seeds and the peril and promise involved in being one. Turns out that Coast Redwood seeds are exceedingly small. Usually less than an inch long, it takes about 100,000 of them to weigh a single pound. And to grow into a full-grown tree, one must fall on fresh, mineral-rich soil that has somehow been exposed. This is rare since it takes fire, flood, or the downfall of an older tree for this to happen; but when it does, it gives these little seedlings a chance to take root. And even though mature redwoods produce thousands of these cones each year, the viability of the seed is low to discourage seed predators (typically well below 15%), which means that the vast majority of the seeds will never have a chance anyway. As I said, direct sunlight rarely reaches the floor of a redwood forest. This leaves the opportunity for shade-loving plants such as moss, ferns, and lichen to thrive in this cool, dim, moist environment, where they may get as little as 5 percent of direct sunlight. On the surface, the Muir Woods seemed darker and quieter than I first imagined, and I was surprised at how little wildlife I saw… until I came across another plaque which illuminated the situation for me. Even though I didn’t see that many creatures besides chipmunks, grey squirrels, and a few birds, I didn’t mind because the other creatures weren’t the main reasons I came. Let’s be honest. You go for the redwoods, and I relished in that. These trees are echoes of another era, and I found their presence grounding and inspiring. Having thrived for millions of years throughout the Northern Hemisphere along with dinosaurs and other plants and animals which are now extinct, redwoods have proven themselves experts at survival. And when a massive meteorite impacted the Earth roughly 65 million years ago, it caused environmental changes that destroyed the dinosaurs and uncounted other species. Redwoods managed to survive the catastrophe and have gone on to survive fires, floods, windstorms, droughts, and earthquakes. They have even survived the emergence of new forms of life, including people, flowering plants, and broad-leafed trees. As the tallest and among the oldest living creatures on the planet, redwoods truly are giant survivors from a time of giants. And while over 40 species of redwoods once thrived in an ancient climate, I’ll focus on being grateful for the 15 species that remain today, serving as a symbol of what life on this planet is capable of as it provides unique habitats and immeasurable inspiration, year after year. I’m exceedingly thankful to the National Park Service for protecting these woods and many other important reserves around the US. The NPS and similar organizations are one of the major reasons we still have any redwood forest left at all, and they’re a great example of a conscious approach toward protecting the planet. 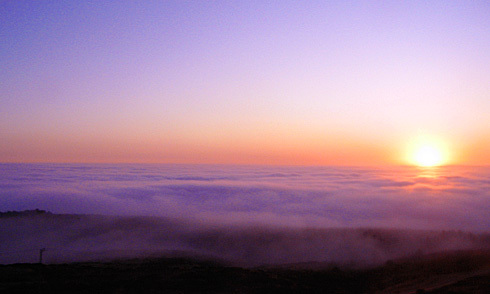 Before the sun had set too low into the sky, we finished off the day by driving along the Panoramic Highway up to an observation point along Mount Tamalpais. To my great delight, I was able to see an incredible view of the clouds rolling over the hills to the south, seeing part of Richardson Bay (and perhaps even a bit of San Francisco) from what felt like a mile up. We were truly above the clouds. Needless to say, it was stunning. The perfect ending to an unforgettable day. Marco the Spacefarer continued to follow me that day and therefore appears in all 26 photos in the photo gallery that accompanies this article. The “Where’s Marco” game is like Where’s Waldo or “I Spy”, but more challenging. And I’m considering putting up hints that show what he’s near. 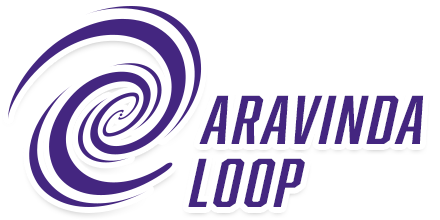 Would anyone be interested in that? Can you find him in all 26? All photos from this event are in the Muir Woods photo gallery. 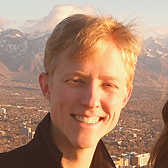 All photos in the Byteful Gallery are under a Creative Commons license. With so much free content on Byteful Travel, why not tell a friend? ← Monty Python’s Spamalot Review: Radical! Mother nature is not only interesting but amazing. 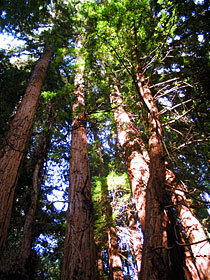 I loved the photos of the redwood forest as well as the sunset scenes. They are exceptional. Wow, very wonderful place. I hope there’s such place in my country like what is shown in the photos. Thank you for sharing your article. It is very educational. Nice post and enjoyed the photos. It is a great place to visit and walk around, get lost in. Great write up and pictures! Muir Woods really is a magical place.